Welcome to Holy Trinity Church,Rothwell, near Kettering, in Northamptonshire. Key messages • The welfare of the child, young person and vulnerable adult is at all times paramount and takes precedence over all other considerations. • The Diocesan Safeguarding Adviser must be consulted whenever a safeguarding concern of any kind arises in your parish. • Safeguarding is part of our core faith and an integral feature of Christian life in our parish churches. 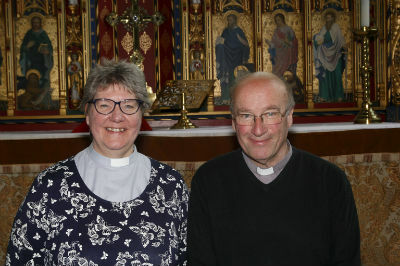 On weekdays John and Ruth would love members of the congregation to join them for Morning Prayer at 9 am in the Lady Chapel. The service lasts 30 minutes and the days it is taking place are indicated in the weekly Pew News. Please ask if you need to know the code for the side door. Our group for children from 3 years upwards meets on the second Sunday of the month. Gather in church at 10.45 am. The aim of the Trinity Discoverers is to find out about Jesus through crafts, songs and activities. Come and enjoy! We are a Church which exists to know Christ in our midst, and to make Christ known beyond our walls. We aim to be an inclusive Church, offering a variety of Worship styles - a place for everyone.